Finance is ordinarily fast (think ‘stock market crash’ or ‘electronic trading’) while nature is slow (think ‘glaciers’). But in Detroit and New Orleans it was the reverse. 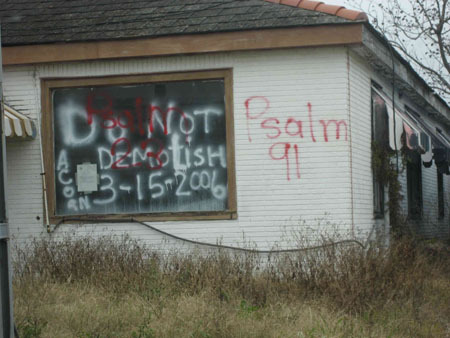 The slow-motion financial ruin of Detroit has extended over five decades, while in 2005 Hurricane Katrina plunged New Orleans into ruin in just a few hours. In both cities, thousands of buildings — like the ones shown here — embody the vector of capitalism. On the left, there is an animated version of a lecture by David Harvey, Distinguished Professor of Anthropology, Graduate Center of the City University of New York. This animation is provided by The Royal Society of Arts, founded in London in 1754. Detroit and New Orleans are separated by roughly a thousand miles, yet in many ways they occupy the same space. 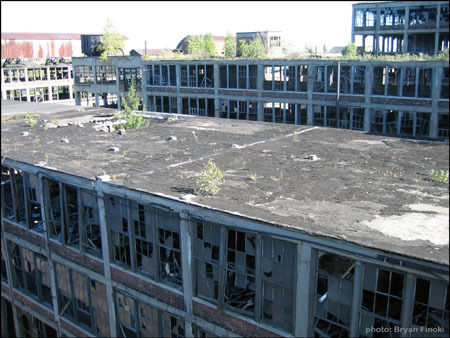 The collapse of Detroit has exposed the boom-bust breakdown of the innumerable American cities on the front lines of deindustrialization. Meanwhile, Hurricane Katrina turned New Orleans into the poster child for the toxic relationship between crisis and capitalism. First the city was at the mercy of private military contractors and the government’s inept emergency-response apparatus, and now it is at the mercy of the predatory agents of redevelopment. Both places are rife with scenes of urban desolation: foreclosed homes, abandoned blocks, shuttered factories, graffiti-bombed schools, fenced-off warehouses, deserted infrastructure—haunted spaces that blur the remains of natural and economic catastrophe. The aftermath of New Orleans presents another aspect of this phenomenon. The city’s crisis has been treated not as an opportunity to rebuild the public sphere but as a chance to secure the reconstructive domain of “disaster capitalism”—Naomi Klein’s name for the half-century-old corporate financial order that preys on crises and exploits gaps in state power. The Detroit/New Orleans landscape can be seen in the imaginary geographies of sensationalized docudramas, action-film backdrops, video-game worlds, and magazine pictorials, where the optics of ruin are harnessed to produce phantasmagorias of the End Times. But behind the veil of pop culture, the image of these places reveals a more pertinent threat: the degradation of state power and the heightened role of sovereign corporations in the production of civic space. Detroit’s devolution stretches back to the 1950s, when the production of cars and bombers, a constellation of new highways, and a dose of nuclear paranoia encouraged the middle class to flee for the suburbs. By the 1960s, the center of the city was left a warren of ghettos populated by jobless African Americans. In 1967, with joblessness climbing and racism rampant, the city exploded into twelve days of riots—the punctuation of an era of prosperity and the beginning of terminal urban neglect. New Orleans was thrust into devastation over the course of a few days, its ruinous trajectory an inversion of Detroit’s languorous decline into industrial rigor mortis. But today, they are both kept in ruin (if only through resolute neglect) to the benefit of those who hold stakes in crisis management, urban redevelopment, and the ever-growing security-industrial complex, all of which require constant instability in order to justify their services. You can also read the anatomy of ruins in Triple Canopy online, volume 7. 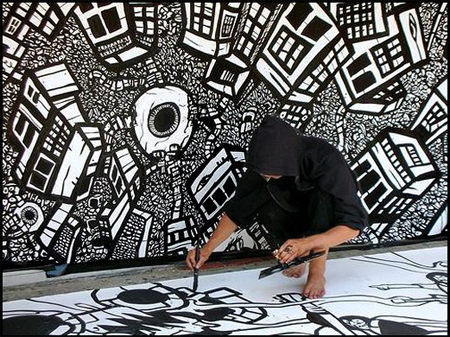 Artist Mike Parsons uses black and white comic book art, surreal animations, public performances, wall murals, graffiti and street art to express an optimistic warning about the future. From a distance the city appears as a giant gear propelled by an endless sea of denizens co-existing amidst a chaotic concrete carnival. Beneath the bricks and bones lies a world of interconnected nightmares, dreams, waking visions and routines: the Amorphous Globular Macroverse – a collection of unusual tales, unconscious ink ciphers, inhuman horrors and disturbed peculiarities. Mike Parsons says, “In order to gain a better understanding of the metropolis I developed a process incorporating live street painting, story telling, and outdoor exhibitions.” Since 1999 he has produced ten major gallery shows, three full-length graphic novels, numerous public murals, and outdoor performances on the Queen Street sidewalks. Parsons’ drawings range in size from postcards to giant wall murals and vary in complexity from crude to microscopic. Each drawing is made with black India ink on white paper, as a single picture without preliminary sketches. 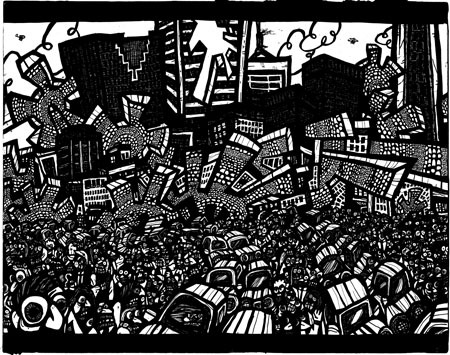 Buildings, people, systems of communication, and weapons appear in a series of drawings called “Hey Apathy” which show the city as a cold, lifeless machine of anonymous crowds and tomb-like towers, accompanied by horrific images of apocalyptic forces obliterating the landscape.